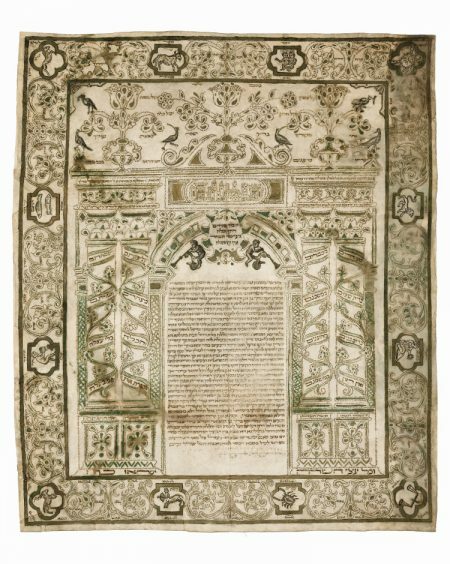 This attractive ketubbah, similar to the previous Casale contract (cat. no. 58), reflects the high achievements of the Piedmontese community in the field of Jewish art. The anonymous scribe-artist who designed the contract created a well-balanced and well-planned composition. Limited to only two colors, green and gold, the decorative program comprises delicate designs, skillfully executed in intricate micrography. A massive archway, supported by two pairs of twisted columns, frames the text. Beneath a cartou- che, which is inscribed with a blessing in honor of the bride and bridegroom, two trumpet-blowing putti ride on unusual one-wheeled vehicles. The putti are not painted; instead they are printed copper engravings, which were cut from an un- known source, lightly painted over, and glued onto the parchment. Crowning the arch is an image of Messianic Jerusalem, which is markedly different from the standard views of the Holy City in Italian Jewish art. Jerusalem is formed entirely from beautiful micrographic script. The image illustrates the words recited at weddings: “I shall put Jerusalem above my chief joy” (Psalms 137:6). This is Messianic Jerusalem or Rebuilt Jerusalem, the ideal city where the bridal couple will reside at the end of time. This idea is strengthened by the twisted columns, which contemporaries believed to recall the shape of Iakhin and Bo’az, the columns named in the Bible that adorned the Temple of Solomon. Outlined in gold, the wide exterior frame is decorat- ed by floral designs and the twelve Signs of the Zodiac, each set in a gilt frame and labeled in square Hebrew letters. The signs themselves are again “readymade” engravings, apparently cut from a popular manual or calendar, and glued onto the parchment. The cycle begins at the top left corner with Aries and proceeds clockwise. To create his many images with intricate micro- graphic designs, the scribe-artist employed lengthy texts. These included wedding poems by Italian rabbis, but primarily the entire books of four biblical scrolls: Esther, Ruth, Song of Songs, and Ecclesiastes. Considering the joyous and festive nature of the event, it is obvious why he left out the fifth scroll, Lamentations. selected literature Bialer 1980, p. 188.